The U.S. Soccer Federation asked the Equal Employment Opportunity Commission to dismiss a complaint of wage discrimination made by members of the World Cup-winning women's national team. Five players filed the EEOC complaint in March, claiming members of the team make in some cases up to four times less than their male national team counterparts. The USSF's response was contained in a position statement sent Tuesday to EEOC's Chicago office by Latham & Watkins, a law firm representing the federation. It says there is no evidence U.S. Soccer is acting with a "discriminatory motive" or is in violation of law. The letter details financial information regarding the team's compensation structure. "The suggestion that U.S. Soccer has been anything other than strongly supportive of the WNT is deeply disappointing and inaccurate," the statement said. Carli Lloyd and Alex Morgan are among the five members of the World Cup-winning women's national team who filed a federal complaint accusing U.S. Soccer of wage discrimination. An attorney for the players who filed the complaint did not immediately respond to a request for comment. The EEOC complaint came after the USSF filed a lawsuit against the players' union in an attempt to establish it has a contract with the U.S. Women's National Soccer Team Players Association that runs through this year's Olympics until Dec. 31. The union maintains the memorandum of understanding agreed to in March 2013 can be terminated at any time. The dispute leaves open the possibility of a work stoppage as the women's team prepares for this summer's Olympics in Brazil. Much of the disparity in wages between the men and women stems from the different ways the players are paid. The women earn salaries and receive biweekly paychecks from the USSF. Base pay is $72,000 for most players, and bonuses are based on game appearances and wins. The women also earn separate salaries for play in the National Women's Soccer League, as well as certain benefits the men don't accrue. 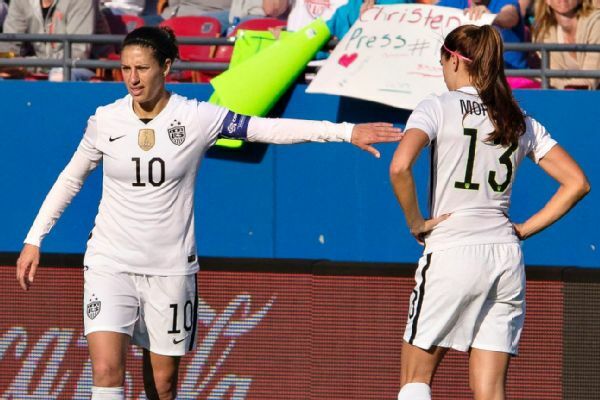 In addition to winning the World Cup, the women's national team played a series of victory tour matches last year. The men are paid based on national team appearances and results, and roster selection for tournaments. Because of the way the contract is structured, the men have the opportunity to make more per game because of bonuses. The pay structure was set up under separate collective bargaining agreements negotiated by unions for the men's and women's national teams. In its statement Tuesday, the USSF maintained "the players bringing this charge earned more money from U.S. Soccer last year than every single member of the MNT." The five players who brought the complaint include Hope Solo, Alex Morgan, Becky Sauerbrunn, Megan Rapinoe and Carli Lloyd. The federation reiterates earlier claims that the men's national team, based on the four-year cycle, generates more revenue overall than the women's team. Revenue, and therefore compensation, fluctuates over that cycle. U.S. Soccer maintains it paid the women's team a greater share of the revenue generated by its games than the share it paid the men's team of the revenue generated by its games in which opponents sometimes have big-name stars who help fill stadiums and boost television ratings. The women have two premier international events, the World Cup and the Olympics, while the men's senior team has only the quadrennial World Cup, because Olympic qualifying is limited to players under 23. "In short, U.S. Soccer believes that the WNT not only is the highest compensated women's national soccer team in the world, but its compensation from U.S. Soccer is comparable to (and in many cases better than) the compensation U.S. Soccer provides to the MNT," the statement said.